The Russet Burbank was developed by and named after Luther Burbank, who developed it from a cultivar known as Early Rose. Today it dominates the American potato crop. Mature tubers are heavy, solid and flavorful. It is the standard for baking potatoes and considered the perfect potato for both French fries and potato chips. When buying, look for potatoes that are heavy and firm. Avoid potatoes with wrinkled skin, soft spots, green spots, or many eyes. When growing potatoes, remember that they need fertile, well-drained soil with ample organic matter. Some authorities see ideal pH as 5.8 to 6.5 or slightly acidic. 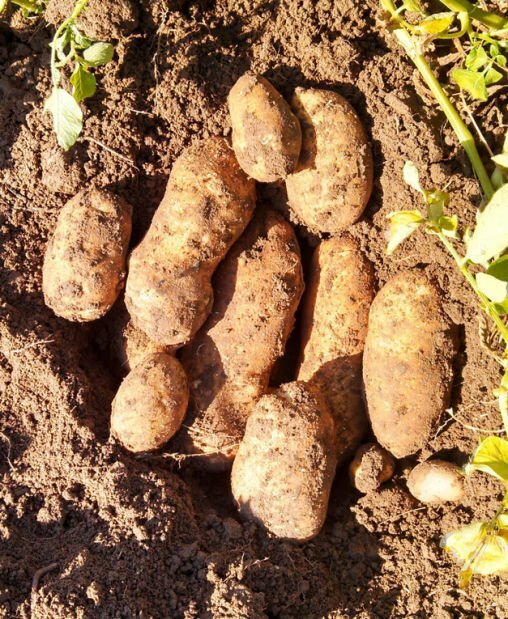 However, most Idaho soil is alkaline, and potatoes have not only thrived in our soil, but the mineral content of our volcanic soil seems to contribute to the success of Idaho potatoes. Always start with certified seed potatoes. Cut into 2 inch pieces with at least one eye on each piece and plant 5-6 inches deep and 8-10 inches apart. Potatoes like sunlight but not too much. Excessive sunlight — especially if tubers are close to the soil surface — will cause tubers to turn green. The potato growing cycle involves several steps: sprouting, vegetative, tuber initiation, tuber bulking, and maturing. Potatoes form during tuber initiation. This is when fertilizer is most important. Potatoes use considerable nitrogen, but too much nitrogen will lead to aggressive top growth and stunted potatoes. Choose a fertilizer with at least as much phosphate and potassium as nitrogen. On the three-number fertilizer code, pay special attention to the second and third numbers. A 8-24-24 bag would contain 8% nitrogen, 24% phosphate and 24% potassium. Where nitrogen encourages a plant to produce more foliage, phosphate and potassium encourage root development. Because potatoes are a root vegetable, phosphate and potassium are critical. Scatter the fertilizer granules around the plants and water in. Follow the manufacturer’s directions. Fertilizer is generally applied at a rate of 1 1/2 pounds per 100 square feet. To avoid burning your plants, keep the fertilizer from touching the plant directly. Begin fertilizing two weeks after planting. Continue to apply fertilizer every four weeks and stop two weeks before harvest. Always water in fertilizer after applying. Start watering with about an inch per week and, after blossoms appear, increase the water to 1 1/2 inches per week. A long soak once per week is better than several short ones. This will allow the water to penetrate the soil and reach the roots of the plants. You want soil to be moist, not wet. If it’s soggy, let it dry out for a couple of days and check again. If it’s dry 4 inches down, add water. Water in the early morning so the afternoon sun can evaporate any water remaining on foliage. Wet foliage encourages disease. Stop watering potatoes after the foliage turns yellow and begins to die off. This will allow the potatoes to mature to the right stage before harvesting. Apply mulch around potato plants after they blossom. Use commercial mulch, grass clippings or straw. This will help the soil retain moisture and suppress weeds. Potatoes can be harvested new or mature. New potatoes should be harvested 15 days after the plants have finished flowering. Mature potatoes should be harvested around two weeks after the foliage yellows and dies back. Using a digging fork, turn over the soil and search through carefully to locate — without damaging — potatoes. Simply shake off the dirt and place potatoes in a cool, dry area for three days. This will allow the skins to cure, which will protect them during storage. Do not wash the potatoes until you’re ready to cook them. After curing, store in a cool, well ventilated area. Potatoes normally mature in 110-120 days, depending on the variety. It’s better to harvest earlier than later. When potatoes mature, they become more vulnerable to pests and wet rot. If rain is predicted or a heat wave, go ahead and harvest before the weather turns unfavorable. From here, it’s on to the table and bon appétit!